How do you punctuate quoted speech in English? Use quotation marks (“) to surround the exact words someone says, asks, or interjects. You can find the quotation mark symbol on the French keyboard on the number 2 key. Place exclamation marks (!) or question marks (?) inside your quotation marks (“). Example: “Get off!” she spat. “Who me?” he asked. To join quoted speech to he said or an alternative, use a comma (,). Each speaker gets his or her own paragraph. Don’t forget to indent paragraphs using the tab key. Practice Finding Quoted Speech Punctuation Errors. 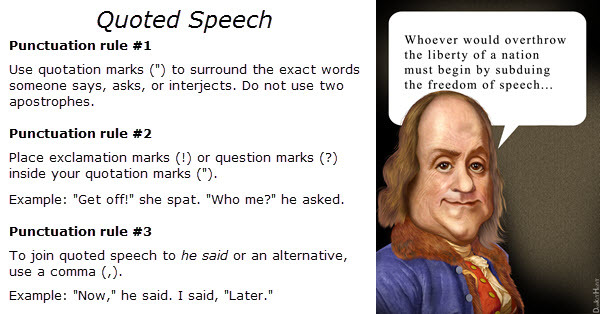 Practice Correcting Quoted Speech Punctuation Errors.